EU Minister Çelik (C) and Foreign Minister Çavuşoğlu (L) were in Brussels on June 30 to attend meetings with EU authorities. The European Union (EU) and Turkey will meet in the coming weeks to renegotiate the counter-terrorism laws within the scope of visa liberalization process in order to reformulate the controversial criteria of the deal. 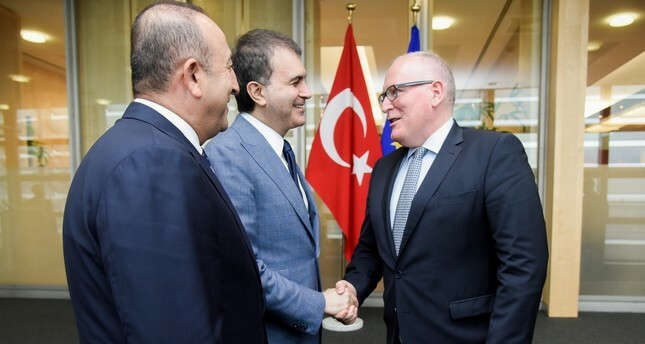 Foreign Minister Mevlüt Çavuşoğlu and EU Minister and Chief Negotiator Ömer Çelik met in Brussels with European Commission First Vice-President Frans Timmermans on Thursday to negotiate the visa liberalization deal. Diplomatic sources indicated that remarkable improvements have been made to the criteria, with the exception of the counter-terrorism laws. Both sides agreed to meet again in order to re-negotiate the related law. Stressing that Turkey is currently fighting against many different terrorist groups simultaneously, FM Çavuşoğlu said, "Visa liberalization is very important. However, fighting against terrorism is also crucial. We cannot make concessions to terrorists simply to get visa-free travel." Additionally, he mentioned that the EU should show tolerance towards Turkey's counter-terrorism laws. In a tweet on his official Twitter account, Timmermans described the meeting as "constructive" and stated that both sides shared their opinions about the remaining benchmarks and the ways to move forward. He added that both sides will meet again in the coming days. On May 4 the European Commission proposed visa-free Schengen zone travel for Turks, but the EU announced that Turkey must fulfill the five remaining benchmarks, including measures to prevent corruption, data protection in line with EU standards, cooperation with EU's law enforcement agency Europol and judicial cooperation on criminal matters with all EU member states. The most controversial remaining benchmark yet to be fulfilled is "revising the legislation and practices on terrorism in line with European standards." This requirement caused tension between the EU and Turkey and the European Parliament has decided to vote on the European Commission's proposal. Meanwhile, President Recep Tayyip Erdoğan indicated that Turkey's counterterrorism measures will continue, adding that Turkey will not accept the counter-terrorism law. Both sides are trying to reach a consensus on the remaining benchmarks. Merkel and the rest of the EU have found comfort recently in the wake of the March 18 deal with Ankara. The number of migrants trying to cross the Aegean Sea to the Greek islands has nearly dropped to zero. Turkey apparently came to the rescue of most EU leaders, who had been under stress in domestic politics. Refusing to grant Turkish nationals visa-free travel without altering anti-terrorism laws, the EU is now at a crossroads. Erdoğan warned the EU by emphasizing that refugees in Turkey can be sent to Europe with "buses and planes," and Merkel's dream could turn into a nightmare in the upcoming weeks. Turkey, the country's northern neighbor, was one of the first countries to open its doors to Syrians displaced by war and sever ties with the brutal Assad regime, which violently suppressed any opposition. Five years on, Turkey still remains the safest haven for refugees who streamed into the country with few possessions, little or no money and no place to call home. Though Lebanon and Jordan, Syria's other neighbors, accepted the displaced, Turkey is lauded by the international community for offering the best accommodation standards to the refugees. Today, 2.7 million refugees from Syria live in Turkey, a figure that was unimaginable when the first group of 252 refugees quietly entered the country in 2011.